My ticket schedule was slightly different than usual. Kaotan was not scheduled for this event for some reason (a horse racing event, according to her blog), and Tani was only scheduled for the night slots, so I didn’t see either of them. 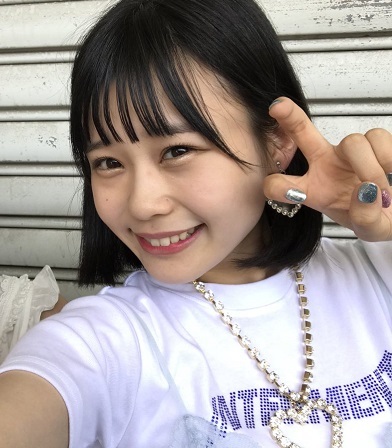 I also wanted to oshi-mashi and see Ran-chan (Kobayashi Ran) but I couldn’t decide which of my tickets to give up, and she was scheduled for Slot 5 only, meaning I would have waited an extra three hours to see her. I have tickets for all three of them on the 21st, so all good. Sakaki Miyu <Cuca> (Lane 74) Interestingly, this is the first time I know of where Cuca’s prize wasn’t an instant win. This means that she is beginning to sell more tickets in the one slot they give her. She wasn’t sold out since her lane was *starred*, but at least it’s progress. And, I DIDN’T WIN! Heh, it was the 2-shot/1-shot prize. Anyway, her line only had a couple people in it, so she saw me heading down the lane toward her booth. After the obligatory greetings, I asked her about the stage play she is going to be in. She completely lit up, and told me that she was very excited and she would be working hard. I gave her my best, and was off. I’m glad I came armed with something to talk to her about this time. Interestingly, aside from Cuca the rest of my tickets were for lanes all stuffed in the far left back of the venue, so I pretty much stayed in one small area for the entire morning. I did walk around a bit just to do a bit of people watching. Akiyoshi Yuka (Lane 40) Yukachan’s lane also offered the 2-shot/1-shot, and this time I won. I was torn which to choose, and ultimately decided on the selfie. Later I noticed most of the fans chose the 1-shot video, and had Yuka-chan do the fashion show. Yuka-chan saw me coming down the lane and smiled. I waved my winning sheet at her, and she exclaimed “Yatta, you won!” Since there was no wait, I wasn’t ready, so I took my time putting my bag in the bin, and getting my camera ready before stepping into the booth. I centered the camera, made sure at least Yukachan was completely in the shot, and fired away! 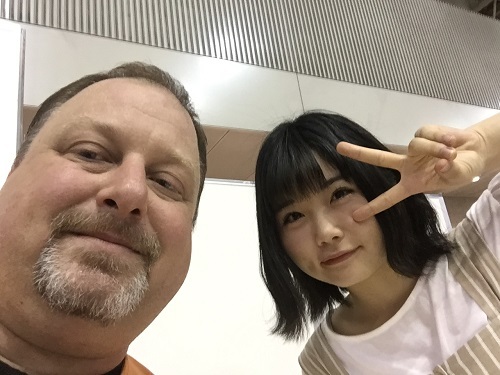 Okay, my selfies are getting a bit better, although I still do them “two-handed.” So it was my chance to congratulate her on her ‘victory’ of sorts. I told her when I saw the smile on her face after she was called it warmed my heart. Yuka-chan exclaimed that she was so glad I came to see her, and thanked me for cheering for her. I told her I would be back a little later. By the way, her sign was all about the types of foods she likes to eat in the Summer. Among her favorites were shaved ice, frankfurters, and some kind of potato dish. The sign asked us what our favorite Summer dishes are, and playfully offered to enjoy Summer foods together. After quickly greeting Gabriel-kun, I told her that I read the sign, and that my favorite Summer foods were American barbecue like spareribs, and hot dogs, and that I liked beach barbeques. I think it surprised her, since I was indeed responding to her questions on the sign. When I mentioned the ribs she got very excited, but quickly my time was up and I was getting pushed out. Akiyoshi Yuka (Lane 40) By the time I made it back to Yukachan her line had emptied out. I didn’t win the signed photo, but I actually already have one, so no biggie. I really didn’t have much more to say to her, so I basically told her about my day during the Sousenkyo, and that I was on a train when people started messaging me about her ranking. Anyway, I repeated that I was very happy for her. Yay, Zukki and I are going to watch fireworks together. Sounds like a fun date. I hope she wears a Kimono! I told her I have been following her Twitter, and I like that she posts lots of cute pictures. She protested that her pictures aren’t cute. (Yeah, right) Interestingly, Zukki is consistently becoming one of my favorite handshake experiences. Even more interesting, I had forgotten I even had this ticket, and only noticed it when I was sorting my tickets at the venue, LOL. So the ‘special’ prize of the day was a signed time-card. What is that you ask? Exactly what you think it might be. An actual time card, which they drop into a time clock at their booth and then sign it. I mean really, this is on the same level of randomness as those signed resumes we won last month. Bibian’s was the only chance I had to win it, and mercifully I lost. Whatever. In the meantime I found a fan’s identification on the ground. I picked it up, and started looking for the person it belonged to. After nobody around me claimed it, I just held it up until either someone said it was theirs, or until a guard came by. Eventually one of the Bibian fans took it and started yelling “Who lost their ID?” Finally a guy in line noticed it was his. The line was going very slow since it was a signing slot. I wasn’t sure how Bibian would react to me since she gave me a semi-dirty look last month when she spotted me in another lane. However, she was just as genki as usual. She was all blinged out to with a bunch of heart-related jewelry. I mentioned that I laughed at her tweet she made during the Japan soccer match the other day. If you haven’t seen it, it’s very cute. Bibian is awesome on twitter. Her tweets ore often so silly. After shaking Bibian’s hand I headed out, but then the guard called me back in. It seems there was a consolation card for people who didn’t win the time-card. Okay, I’ll take it. And it also meant I got an extra few seconds with Bibian since she reached out to grab my hands once again. And that was it. I was able to win 2 prizes out of six, which is about par for the course. Although admittedly I was surprised I didn’t win a couple of them. But it was 12:30, and I was heading home to 1) write this, 2) rest, and 3) get on this major assignment I have that’s due in two days. 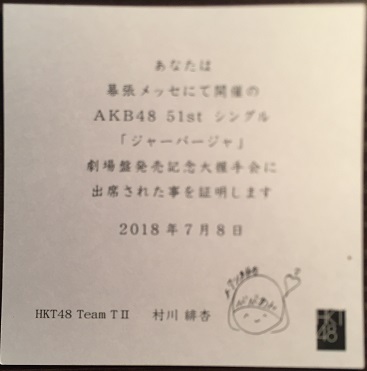 My next 48-group related events will be AKB’s Teacher Teacher event on the 21st, and then HKT’s handshake event in early-August. I have a couple of interesting members scheduled, so we’ll see how it goes.